Is the extra large PlexiDor constructed differently than the smaller doors? 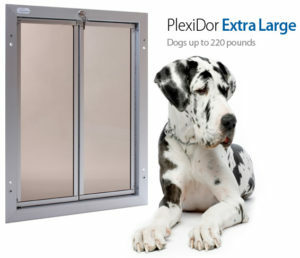 The extra large PlexiDor is constructed to withstand daily use by dogs up to 220 pounds, and the panels are different than on the smaller models. Dogs larger than 220 pounds may still be able to use the door – it will depend on their build. Smaller pets can usually open and go through the extra large dog door – the panels swing easily. Contact our customer service at 800-749-9609 if you’re uncertain. Extra large dogs can be tough on equipment just because they’re so big – the impact of a dog this size running through the pet door many times in a day puts a lot of stress on the panels. Thus, this door looks similar to the smaller models, but the panels are designed to be even tougher. The Extra Large PlexiDor has all the features of the smaller models with weather seal and aluminum frame, but the panels are made from a solid sheet of shatter-resistant acrylic. The panels are lined with a chew proof aluminum trim. The door is available for installation through a house door, through a wall, or in a glass kit. The aluminum frame is available in white, bronze, or brushed aluminum.